The African Research Collaboration on Sepsis (ARCS), African Sepsis Alliance (ASA), and African Institute for Development Policy (AFIDEP) have published a sepsis policy brief. The document highlights the benefits of addressing sepsis in Africa and the key actions required from health policy makers. Our friends from the Global Sepsis Alliance have released their World Sepsis Day Infographics in French today, as a free download in their toolkit section, next to English, Spanish, and German. Given many parts of Africa speak French, please feel free to download them and use them wherever you see fit, for example on social media, printed at your events, or everywhere in between. There are a total of 21 infographics, nine on sepsis itself, ranging from symptoms, sources, prevention, risk groups, to physiology, post-sepsis symptoms, and more. Additionally, there are two on hand-washing, and ten more pointing out the relationship to other World Health Days, such as World Malaria Day, World AIDS Day, World Immunization Week, and more. The infographics are available as images (.png), as well as optimized for print (.pdf). If you find any translation mistakes or have any other feedback, please let our colleagues from World Sepsis Day know. Please join us in spreading these infographics to bring sepsis awareness to all parts of Africa. The African Research Collaboration on Sepsis (ARCS), African Sepsis Alliance (ASA), and African Institute for Development Policy (AFIDEP) have joined forces to publish a sepsis fact sheet for stakeholders in Africa. The document highlights what sepsis is, causes, burden and benefits of addressing sepsis in Africa. Africa has the youngest population in the world. It also has the highest burden of disease of infections. Everybody in Africa deserves to be able to survive sepsis. Please download and share the fact sheet with healthcare workers, stakeholders, and policy makers. 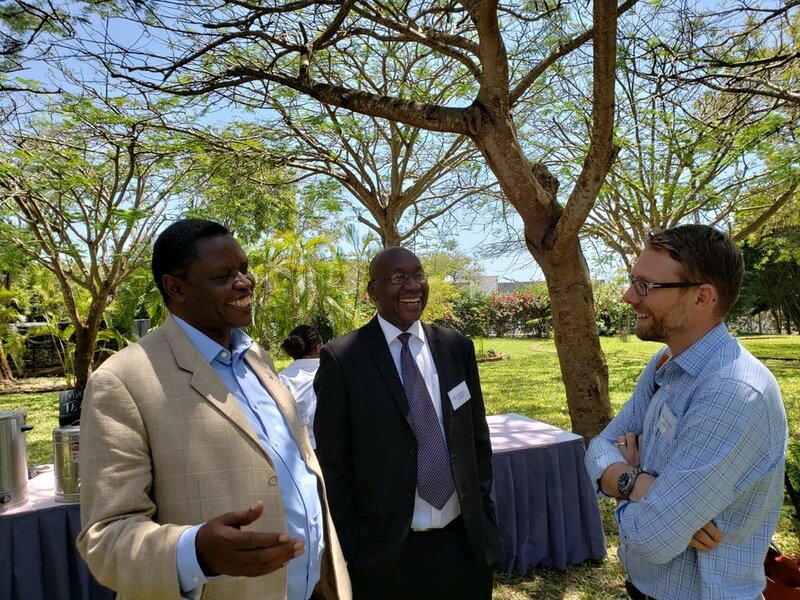 The 2nd African Sepsis Symposium was held on the 4th of October 2018 in Mombasa, Kenya. The symposium was organized by the African Sepsis Alliance, the Critical Care Society of Kenya, and the African Federation of Critical Care Nurses. Presenters included international sepsis experts as well as local experts involved in antibiotic stewardship, improving diagnosis, and infection control. There were over 300 participants - predominantly critical care and senior nurses - from over 10 African countries. Participants received training about prevention, recognition, management, and post-discharge care for children and adults in Africa. The African Research Collaboration on Sepsis (ARCS) was also advertised and discussed. ARCS is a newly launched collaborative, led by the Liverpool School of Tropical Medicine and funded by the National Institute for Health. It focuses on sepsis research in non-pregnant adults and will involve a short incidence study, development of quality indicators for critical illness and sepsis in Africa, as well as providing opportunities for training in research. The Centre for International Child Health (part of BC Children’s Hospital) ran a paediatric sepsis collaborative workshop to demonstrate tools used to improve the quality of care in low- and middle-income countries and how data from these tools can be shared to improve the overall burden of sepsis. MedReach filmed the entire symposium and has made the symposium available to clinicians from low- and middle-income countries free of charge via their online platform. We would like to thank all our supporters and sponsors who made this event a great success. The symposium poster and program can be downloaded below. Everybody in Africa deserves to be given a chance to survive sepsis. The Global Sepsis Alliance is conducting a global survey, which will operate through 2 arms. On October 4th, 2018, the African Sepsis Alliance will hold the 2nd African Sepsis Symposium in Diani, Kenya, in collaboration with the African Federation of Critical Care Nurses and the Global Sepsis Alliance. The African Sepsis Alliance is a collaboration of over 15 African countries and international professional bodies working together to prevent sepsis and improve care in Africa. Everybody in Africa has a right to survive sepsis and we provide leadership to reduce mortality and suffering for sepsis in Africa. Africa bears a disproportionate burden of preventable deaths from sepsis globally. Over 400 local and international experts, healthcare workers, and policy makers are expected to attend the symposium in Diani. Participants will review and discuss sepsis prevention, recognition, and management efforts in Africa. This years’ multidisciplinary symposium will focus on paediatric sepsis, antimicrobial resistance, and stewardship. The Kenya Sepsis Alliance will also be launched at the event. The exciting conference program can be found below. If you would like to attend or join our growing list of prestigious sponsors for the symposium, please contact Wangari Siika, Chair of the local organizing committee, or Emmanuel Nsutebu, Chair of the African Sepsis Alliance. Please join us and help make a difference in Africa! On September 5th and 6th, the Global Sepsis Alliance, initiator of World Sepsis Day and World Sepsis Congress, will host the 2nd World Sepsis Congress. The 2nd WSC is a free online congress in which over 100 renowned experts from all around the world will give presentations on all aspects of sepsis, bringing knowledge about sepsis to all parts of the world. The congress is a great opportunity to learn about sepsis from the comfort of your home or office. The congress will be held in English and is open to everyone with an internet connection. On September 27th, the 'International Sepsis Symposium' will be held in Glasgow, Scotland. An incredible line-up of sepsis experts from around the world will give short, punchy talks on a variety of sepsis topics, to aid the practicing clinician. £10 from every ticket sale is being donated to the African Sepsis Alliance - a huge thanks to the organizers for recognizing the urgency to fight sepsis in Africa and supporting us directly. The early-bird tickets have been extended until the end of April and 6 CPD points have been applied for from The Royal College of Physicians. Let’s mobilize healthcare workers, policy & decision-makers, patients, and relatives to join the Campaign. The WHO calls on health facilities to prevent healthcare-associated sepsis by improving hand hygiene and infection prevention and control (IPC). Sepsis is estimated to affect more than 30 million patients every year worldwide. At the Seventieth World Health Assembly in May 2017, Member States adopted a resolution on improving the prevention, diagnosis and treatment of sepsis. Healthcare-associated infections are common and are a risk factor for developing sepsis. However, most of these infections are preventable. Effective hand hygiene plays a key role. On World Hand Hygiene Day (May 5th 2018), the focus for everyone should be on prevention of sepsis in healthcare. The African Sepsis Alliance is partnering with the WHO to raise awareness about antimicrobial stewardship, antimicrobial stewardship, and hand washing in Africa..
Join us in preventing sepsis in Africa. Please find new May 5th resources, including 2018 campaign posters (one for a general advocacy and the other 5 for different target groups, highlighting the call to action to them which you can be placed around health facilities). The map of health facility registrations has been updated recently. Please register your organization and encourage more health facilities to sign up. The updated the advocacy slide set (English version) as a PDF, please use some or all of this in any presentations you are giving as part of your campaign. You can find the campaign message in languages other than English through the links on this page. The Sudan Sepsis Alliance hosts International Sepsis Conference and is given a prestigious GSA Award by the Global Sepsis Alliance. The Khartoum resolution was produced - Sudan has agreed to host a conference of African Ministers of Health to discuss a joint strategy for Africa. African countries are urged to develop a similar program to tackle sepsis. Over 700 doctors, nurses, pharmacists, allied health professionals, and students met at the international sepsis conference organised by the Sudanese Sepsis Alliance on February 1st, 2018, in Khartoum. Participants discussed the challenges and opportunities for improving sepsis care in Sudan and Africa. They also discussed achievements and what needs to be done to improve prevention, recognition, treatment, and rehabilitation. A preconference meeting was also held on the January 31st, 2018, and chaired by Professor Mamoun, Khartoum State Minister of Health. Most of the participants were from Sudan, however, other African countries such as Nigeria, Djibouti, and Kenya were represented. Representatives from the Global Sepsis Alliance and the African Sepsis Alliance were also present. The Sudanese Sepsis Alliance was given a prestigious GSA Award. This award recognises all the work they have done to improve sepsis prevention, recognition, and treatment in Sudan. A Khartoum resolution was agreed to arrange a conference of African Ministers of Health to develop a joint strategy and plan for sepsis improvement in Africa. Professor Mamoun agreed to sponsor and host the conference within 12 months and in collaboration with the African Union. We urge you to sign the Kampala declaration and support sepsis improvement in Africa. Everybody in Africa has a right to survive sepsis. Today, the African Sepsis Alliance is incredibly excited to unveil its logo. The colorful circle of people emphasizes the amount of teamwork and dedication necessary to free Africa of sepsis. If you want to join our fight against sepsis, please sign the Kampala Declaration or get in touch. We are looking forward to hear what you think about the logo - please give us feedback on Facebook or get in touch to let us know. On October 20th, representatives from the African Sepsis Alliance, the Global Sepsis Alliance, the African Federation of Critical Care Nurses, and the World Federation of Critical Care Nurses came together in Kampala, Uganda, to formulate demands and steps necessary to fight the global silent killer sepsis in Africa. We urge you to commit your organization or yourself to the enclosed pledge and, in so doing, join the body of enlightened people and organizations from Africa and around the globe dedicated to reducing the health, economic, and human burden of sepsis. Please sign the Kampala Declaration and contribute to saving millions of lives every year. Download the Kampala Declaration now (PDF, 0.3 MB). Please click here to sign the Kampala Declaration on change.org now. Download the official pledge to sign the declaration (PDF). Welcome to the new website of the African Sepsis Alliance - we hope you like it. We are just getting started, so please excuse us for looking a little rough around the edges. If you want to contribute, join, or get in touch, please contact us!